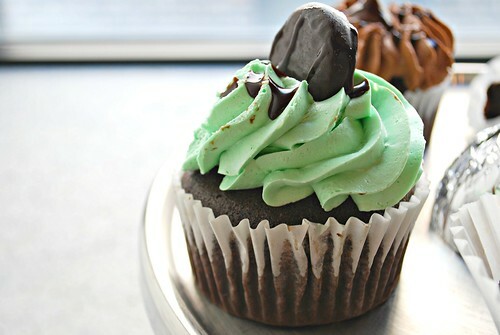 This cupcake is one for every chocolate and mint combo fan out there. 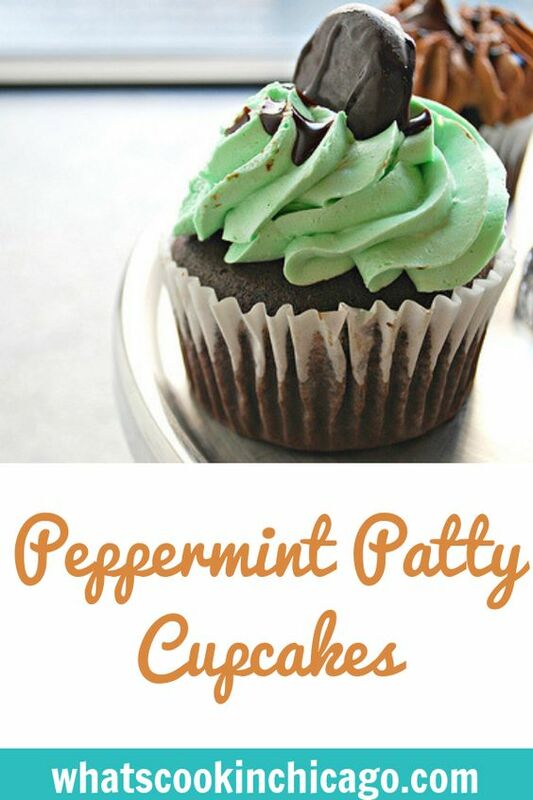 The chocolate cupcake has a touch of peppermint extract for a nice hint of mint. Then the frosting ties it back together with more peppermint extract. We can't forget the light green hue so food coloring is added. But the best part is the garnish. Peppermint Patty candies and a drizzle of chocolate syrup makes these cupcakes irresistible! In a large bowl of a stand mixer fitted with a paddle attachment, cream together the cream cheese and butter until smooth. Add the powdered sugar and mix on medium speed, adding the heavy cream slowly. into the bowl. Once you've reached the desired frosting consistency, stir in the extract and green food coloring. Transfer frosting into a piping bag fitted with a decorated tip and pipe onto the top of cupcakes. Garnish with a Peppermint Patty candy and drizzle with chocolate syrup. Peppermint Patties were a chiildhood favorite, a special treat because my mom would buy them for herself and allow me to take from the bag once in a while. Love them. So these cupcakes sound fabulous... and are definitely pretty! ahhh looks like something straight out of an awesome cupcake shop! I wish I had one of these now! Love the peppermint patty and chocolate drizzle on top! These look delicious! My daughter and I both love chocolate mint. I am soooooo gonna make these. My hard to feed 8 year old loves chocolate mint! Yum! I love mint and chocolate :) These look delicious! I'm not into chocolate and mint, but these are so pretty! I love anything minty so these are on my make list. Wow, I don't know why, but when I saw the post for this on your feed, I jumped on it immediately. I love peppermint (that's a good reason why I love holiday season baking), and these look delicious!